It’s going to happen. If you are a writer who ever shares your writing, it will happen. You will receive either solicited or unsolicited criticism. What you do with that can either improve your writing or make it worse. What to do? Consider the source. Did you solicit this critique? If so, ask yourself why you asked this particular person and consider the remarks strictly within that context. For example, I have lit head friends I ask to read my work and I want them to Rip. It. Up. Sometimes they are too kind, but oh sometimes they bleed all over it, and I can’t tell you how grateful I am when they do. I may not agree with their suggestions and conclusions and I revise with that in mind, but sometimes they are dead on and I want to worship at their feet for their keen observations. Then there are those I ask to read who I just need to run the plot by for “uggy” points or inconsistencies. And to see if it’s a fun/emotional read. I listen just as carefully to those readers. The worst person to ask to read your work? Someone whose approval you seek who maybe doesn’t have the chops to edit your work. Don’t do. Just don’t. Because A. It’s pathetic. And B. If they do love your work (and you’re brilliant so of course they will, right?) they may steer you in the wrong direction if they don’t have the skill level to truly help you. Consider carefully the suggestion itself. Some things are truly a matter of style and it doesn’t matter a tinker’s dam(n) (it is spelled both ways in multiple places) which way you write it. But if it’s a matter of using nonstandard English and you’ve done it for effect, keep it in unless your critic makes a great argument against. I was truly pleased with one of my early published stories, and I still re-read it in its published form occasionally for inspiration. Every beat feels right – almost. Those few lines that were edited that I didn’t quibble over, though, stop me every time. Don’t get me wrong – I’m not against editing, but those areas were not, in my opinion, improved by this person who doesn’t quite have my esthetic. In this case I should have fought for my words. This surely doesn’t need saying, but if you receive unsolicited criticism, feel free to ignore it. But if you’re a good writer who wants to get better, still study it. It may be a gift from the Universe. If you make a mistake and it’s pointed out (either publicly or privately), take it on the chin. You screwed up. Deal with it. I’ve learned from my mistakes. Often that sort of feedback comes too late to spare us present embarrassment, but thank goodness for short memories, yes? And for future opportunities to get it right. You are the only one who knows what you are trying to say. You are the only one who knows if writing ten miles out of the way and then coming back in and loping that off is the way to go. If it’s not a finished product (and is it ever, really? ), feel free to accept or reject anything. Even if a salient point is made, what’s most important is your artistic goal. Don’t allow someone else to guide you off course. YOU are the final authority. 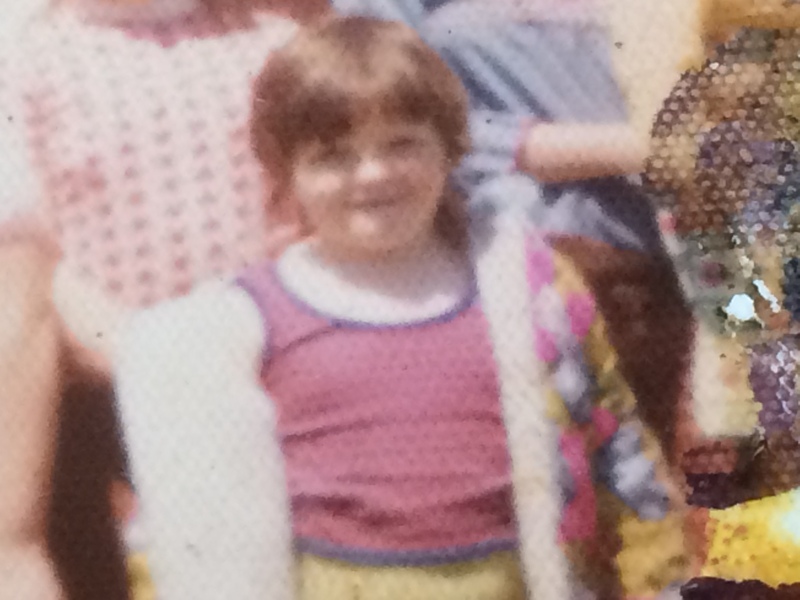 For your amusement: me as a little chunk muffin. Probably age 5. Who put that outfit together? Looking at the colors, I’m guessing me.